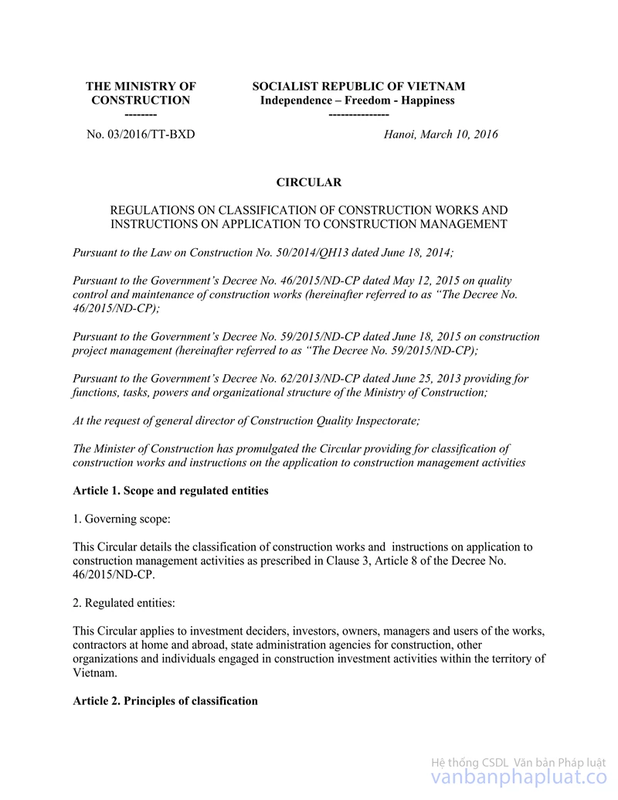 The Government promulgates the Decree on quality control and maintenance of construction works. This Decree provides guidance on the Law on Construction in terms of the construction work quality control in the inspection, design and construction activities and in terms of maintenance of construction works and resolution of construction work incidents arising during the construction. This Decree applies to the investment deciding authorities, the investors, owners, managers and users of the works, domestic contractors, foreign contractors, regulatory bodies in terms of construction and organizations and individuals relating to the quality control and maintenance of construction works. 1. 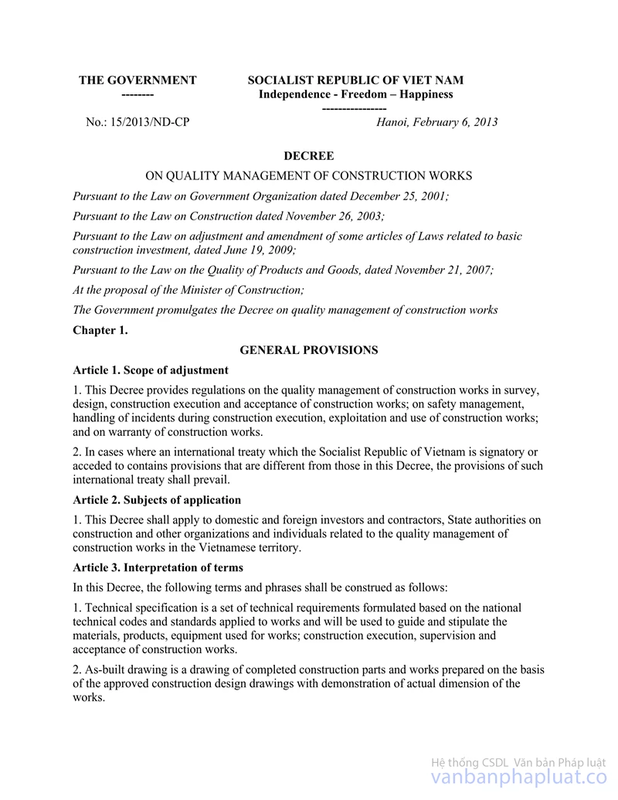 ”Construction work quality control” means the management of the entities involving the construction activities according to the provisions of this Decree and other relevant legislations in the preparation, investment, construction and operation of the works so as to ensure the requirements of quality and safety of the works. 2. ”Technical instructions” means the collection of technical requirements on the basis of the technical standards and criteria applicable to the works, the construction engineering plan for guidance and regulations on materials, products and devices used in the works and for the construction, supervision and acceptance for the construction works. 3. ”As-built drawing” means the drawing of the completed construction works, including the location, size, materials and devices in reality. 4. “Construction completion dossier" means a collection of documents relating to the investment and construction of the works subject to retention when the works are brought into use. 5. "Specialized construction experiment” means the measurement to identify the characteristic of construction land, building materials, construction environment, building products, construction parts or construction works in a certain procedures. 6. “Construction monitoring” means the supervision, survey and recording of the geometrical change, the deformation, the move and other technical parameter of the works and the surrounding environment . 7. “Construction surveying" means the measurement to determine the location, shape and size of the topography and the works for the construction, quality control, maintenance and resolution of construction work incidents. 8. “Construction inspection” means the inspection and evaluation of quality or causes for problems, value, expiration of use and other technical parameter of the building products, construction parts or construction works through the survey and experiment associating with calculation and analysis. 9. “Construction assessment” means the inspection of the construction and the evaluation of adherence to the legislations on construction investment that are conducted by a competent State management agency or at the request of such agency. 10. “Construction-related judicial assessment” means the activities relating to construction according to the proposal of presiding agencies, presiding officers or at the request of assessment applicant according to the legislations on judicial assessment. 11. “Conformity assessment in construction” means the assessment of the conformity of building materials and building products with the relevant technical standards that are applied. 12. “Conformance testing in construction” means the testing of the conformance of products, goods, service, process and environment with the corresponding criteria. 13. Maintenance of construction works means the collection of activities to ensure and maintain the applicability and safety of the works according to the engineering plan during the operation. The maintenance of construction works may include one, some or all of the following activities: inspection, monitoring, quality assessment, maintenance and repair of works, excluding the activities that cause change to the functions and scope of the works. 14. “Construction maintenance process” means the regulations on procedures, content and instruction on performing the maintenance activities of the construction works. 15. Design life of works means the expected duration of time that the work is operated, ensuring the requirements for safety and function. The design life of the works is specified in relevant technical standards, applicable criteria and the construction engineering plan of the works. 16. “Actual time limit of operation of works” (hereinafter referred to as actual life of works) means the actual duration of time that the works are used, ensuring the requirements for safety and functions. 17. ”Construction work warranty” means the commitment of the contractor on the responsibility for remedying and repairing of possible breakdown during the operation of construction works. 18. “Owner of works” means any individuals/organizations enjoying the ownership over the works according to the legislation. 19. “Manager/user of works” is the owner of works in case he/she is the owner who directly manages or uses the works or he/she is authorized by the owner to manage and/or operate the work. 1. Construction works shall undergo the quality control according to the regulations in this Decree and relevant law provisions during the preparation, investment, construction, management and use of works to ensure the safety of human lives, properties, equipment, main works and adjacent works. 2. Completed work items and works shall be brought into operation only when the acceptance for the conformity with requirements of the construction engineering plan, applicable criteria, technical standards, requirements in the construction contract and relevant law provisions is gained. 3. Any contractor involving the construction shall satisfy the requirements for capacity according to the regulations and shall have measures for self-management of quality of the allocated building tasks. The principal contractor or the general contractor is responsible for managing the quality of the parts of works carried out by the subcontractor. 4. The investor is responsible for organizing the quality control of the works according to the form of investment, form of project management, form of subcontract, scope and capital sources of investment during the construction according to the regulations in this Decree. The investor that satisfies the conditions of capacity according to the legislation may carry out the construction activities themselves. 5. 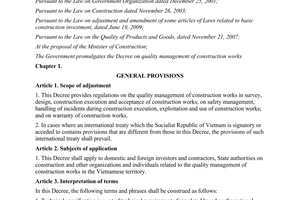 The construction authority shall provide guidance, conduct inspection over the quality control done by organizations/individuals involving the construction process; carry out appraisal of the engineering plan, inspection over the work acceptance, assessment of the construction work quality; make proposal and handle the violations against the regulation on quality of construction works according to the legislations. 6. Any entities involving the construction process mentioned in Clauses 3, 4 and 5 of this Article shall be self-responsible for the quality of the allocated parts. b) The project management board shall be responsible to the investor and the law according to the allocated duties and authority. b) The project management consultant contractor and the construction supervising contractor are responsible to the investor and the law for the allocated responsibilities. 3. 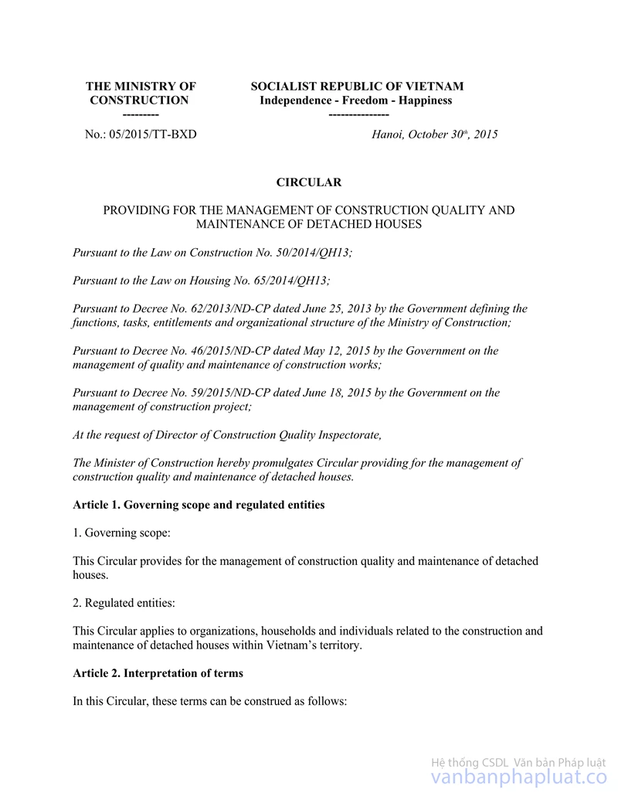 The Ministry of Construction shall provide detailed guidance on responsibilities for construction work quality control of the investor; assign the responsibilities of entities relating to construction work quality control of the investment under general contracts/joint-venture contracts or the investment in the form of public-private partnerships. 1. The application of technical standards or criteria in construction investment shall comply with the regulation in Article 6 of the Law on Construction and the relevant regulations promulgated by the Ministry of Construction. 2. The application of foreign criteria shall be enclosed with the description of necessity for it. 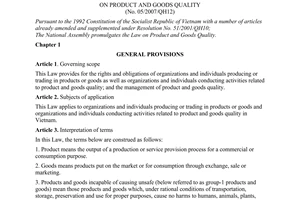 Any foreign criterion that is applied shall be enclosed with its full text in computer file or a printed copy with a Vietnamese or English translation of the to-be-applied parts. 3. 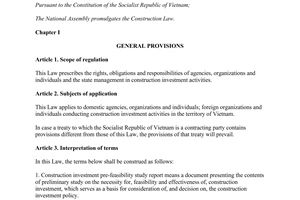 Any new technological solutions and materials for construction that are initially used in Vietnam shall satisfy the technical standards and conform to the relevant legislations. The contractor who proposes the application of new technological solutions or materials shall present the basis and documents proving the safety, effectiveness and feasibility of such application to a competent agency for appraisal during the appraisal process of the construction engineering plan according to the legislations on construction. 1. The quality control for construction of detached housing shall be in the principle of ensuring the safety of human, property, equipment, main construction, adjacent constructions and surrounding environment. Entities involving the construction investment of detached housing shall comply with this Decree in the quality control for detached housing. 2. 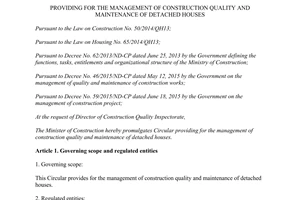 The Ministry of Construction is responsible for providing guidance on construction work quality control for detached housing. e) National defense and security construction. These constructions are specified in the List in Appendix I enclosed herewith. 2. Regarding the constructions other than those specified in sections I to V of Appendix I enclosed herewith, the Ministry of Construction shall preside over and cooperate with the Ministries managing the specialized construction works in determining the type of the construction. 4. Grading of construction works is for making construction engineering plan and for the managing the contents specified in technical standards, criteria and relevant law provisions. 5. The Ministry of Construction shall preside over and cooperate with Ministries managing specialized construction works in providing guidance on grading of construction works as prescribed in Clause 4 of this Article. b) Awards for high-quality construction works and other awards for quality. 2. 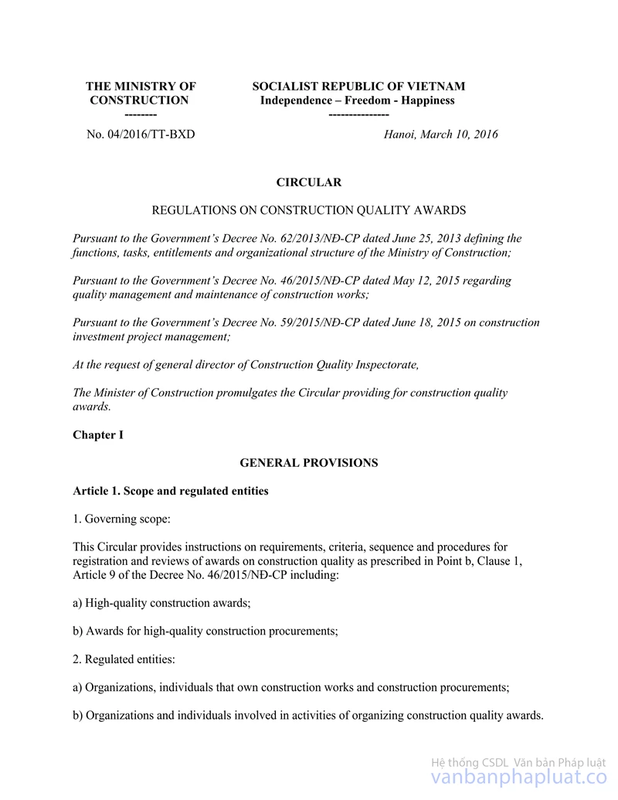 The awards for quality of construction works prescribed in Clause 1 of this Article are the bases for ranking and assessing the capacity and the result of the activities of organizations/individuals involving the construction investment and consideration for award for contract according to the regulation in Clause 1 Article 146 of the Law on Construction. 3. 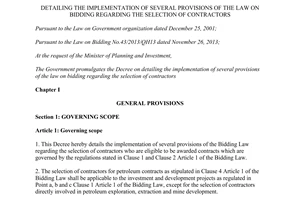 The contractors receiving awards for construction quality prescribed in Clause 1 of this Article are prioritized when participating in bidding relating to construction activity according to the legislation on bidding. The contractors shall receive priority only if the awards they received are presented within the latest 3 years before the year they apply for bidding. The investor shall include such contents in the invitation for bid. 4. 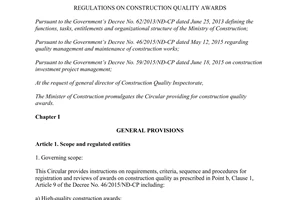 The Ministry of Construction shall provide guidance on the form, conditions, criteria and procedures for application and consideration for presenting awards for construction work quality. 1. Construction specialized experiments, construction monitoring, construction inspection and certification of conformity are the conditional construction consultant activities. Any organization carrying out such activities shall obtain registration and shall be recognized as prescribed in the regulations. Any individual carrying out such activities shall have appropriate practice certificates. 2. The Ministry of Construction shall provide guidance and instructions about the activities prescribed in Clause 1 of this Article. 1. 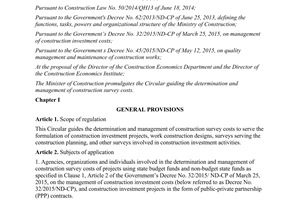 Establish and approve the construction survey objectives. 2. Establish and approve the technical construction survey plan. 3. Manage the quality in construction survey. 4. Inspect, grant acceptance and approve the technical construction survey result. 1. The plan on construction survey objectives is established for the survey activities, supporting the establishment of construction investment project, construction engineering plan, engineering plan on repair, renovation and expansion of works or supporting other survey activities relating to the construction. 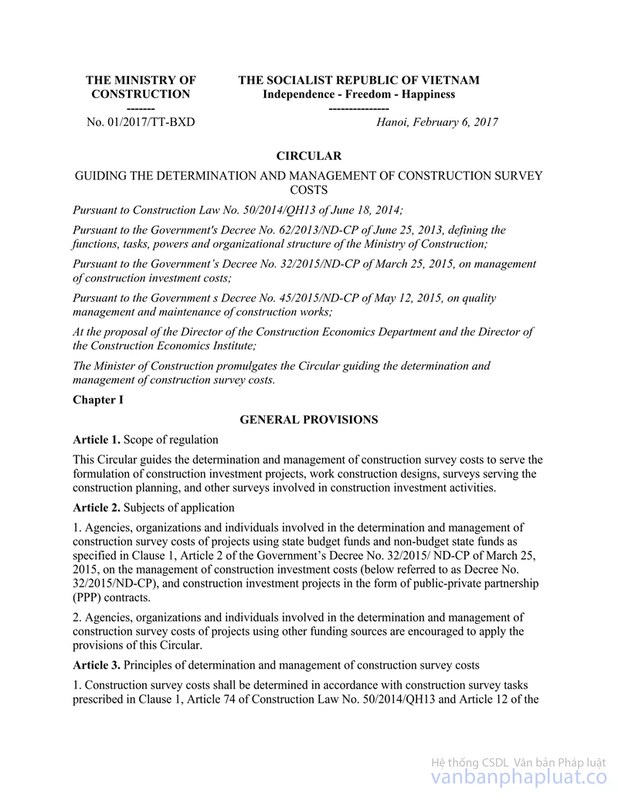 dd) Duration of construction survey. c) During the construction process, a number of factors are determined unusual from the survey records and/or the engineering plan that may affect the quality of construction and/or the measures for construction. 5. When establishing the survey, the engineering contractor shall base on the survey objectives and the survey results of the previous engineering plan step and the result of relevant survey that is completed before (if any). 1. The surveying contractor shall establish the technical construction survey plan according to the construction survey objectives, the applied criteria for construction survey and submit to the investor for approval. g) Measures for ensuring the safety of human, equipment, technical infrastructure constructions and other constructions in the surveyed area; measures for environmental protection and preservation of landscape in the surveyed area and restoration of the site after the survey. 3. The investor is in charge of checking and approving the technical construction survey plan. The investor may hire an eligible consultancy unit to appraise the technical construction survey plan as the basis for the appraisal activities. 1. The surveying contractor shall arrange sufficiently the eligible people to conduct the surveys according to the regulation in the construction contract; assign an eligible person to be the director of the survey and apply the measures for quality control specified in the technical construction survey plan. b) Conduct supervision and inspection over the conduction of construction survey, including: location, survey load, surveying process, retention of surveying data and testing sample; inspection over the experiment in laboratory and on-site; inspect the ensuring of labor safety and environmental safety during the survey. 3. The investor is entitled to suspend the survey if the contractor is determined to not comply with the approve survey project or the regulation in the construction contract. 3. The generality of location and natural conditions of the construction survey site, characteristics and scope of the construction. 4. Load of completed construction surveys. 5. Experimented and analyzed result and data from construction survey. 6. The opinions, notes and/or suggestions (if any). 7. Conclusions and proposed solutions. a) The investor shall inspect the completed construction survey workloads, check the conformity of specification, quantity and content of the survey report with the regulations on construction survey objectives, technical construction survey plans approved by the investor and the regulations in the construction contract. If the construction survey report is satisfactory, the investor shall send the surveying contractor a written notification of acceptance. b) The investor may hire an eligible consultancy unit to check the construction survey report as the basis for the decision about acceptance. 2. When the notification is sent, the investor shall grant the acceptance directly to the construction survey report and shall be responsible for such acceptance. 3. The surveying contractors shall be responsible for the quality of their construction survey. The acceptance and approval for construction survey report of the investor does not cause change or reduce the responsibilities for the quality of construction survey carried out by the surveying contractor. 4. The construction survey report is a part of the construction completion dossier and shall be retained according to the regulations in Article 33 of this Decree. 1. Establish construction engineering objectives. 2. Manage the quality of construction engineering planning activities. 3. Carry out appraisal and inspection of the construction engineering plan. 4. Grant approval for the construction engineering plan. 5. Grant acceptance for the construction engineering plan. 1. The investor or eligible organizations/individuals hired by the investor shall establish the construction engineering objectives. 2. The construction engineering objectives shall be conformable with the pre-feasibility study report or the report on the proposed construction investment policies. Construction engineering objectives are the basis for establishing construction investment project and construction engineering plan. The investor may hire an advisory organization or an advisory expert or inspect the engineering objectives if necessary. dd) Requirements on scale and time limit for the use of works, functions and other technical requirement on the works. 4. The construction engineering objectives shall be modified according to the actual conditions to ensure the effectiveness of the construction investment project. 1. Technical instructions are the basis for the supervision, construction and acceptance of the construction works. Technical instructions shall be established by the engineering contractor or the consultant contractor that are hired by the investor. The approved technical instructions are a part of invitation for construction bidding, the basis for management, supervision and acceptance for construction works. 2. The technical instructions shall conform with the technical standards, the criteria applied to the approved construction and the requirements of the construction engineering plan. 3. Special grade, grade I and grade II construction works shall have technical instructions. Regarding vestige works and other works, technical instructions may be established in separate dossier or included in the description of construction engineering plan. d) Submit the engineering documents to the investor for appraisal and approval according to the regulations on the Law on Construction; accept the appraisal opinions and modify the engineering documents according to the appraising opinions. dd) Modify the engineering plan according to the regulation. 2. The engineering contractors shall be responsible for the quality of their construction engineering plan. The inspection, appraisal and approval for the engineering plan done by individual, organization, investor, investment deciding authorities or construction authority does not replace or reduce the responsibilities of the engineering contractor on quality of their construction engineering plan. 3. If the engineering contractor is the general engineering contractor, such contractor shall be take charge of planning the main items or technology of the works and shall be wholly responsible for signing and carrying out the contract with the contract awarder. Engineering subcontractors are responsible for the progress and quality of engineering plan to the general contractor and the law for their tasks. 4. During the construction engineering planning of important national works, large-sized works with complicated technical requirements, the engineering contractor may propose to the investor to conduct the experiments or imitative test to check and determine the capacity of the construction work to complete the engineering plan, ensuring the technical requirements and construction safety. 2. Size, scale and title block of the drawing shall satisfy the applicable criteria for construction. The title block of each drawing shall include names and signatures of the direct engineer, the engineering inspector, the engineering director and the legal representatives of the engineering contractor and the seal of the engineering contractor (in case the engineering contractor is an organization). 3. The description, drawing and estimate shall be bound together, shall be enumerated with number and symbol for long-term searching and retention. 1. The appraisal, inspection, approval, acceptance and adjustment of engineering plan and technical instructions of construction engineering documents shall comply with the regulations in the Law on Construction and the Decree on construction investment project management. 2. The construction engineering document is a part of the construction completion dossier and shall be retained according to the regulations in Article 33 of this Decree. 1. Quality control for materials, products, structural components and equipment for construction. 2. Quality control by the contractor during the construction process. 3. Supervision of the construction by the investor, inspection and acceptance for building tasks during the construction process. 4. Designer's supervision by the engineering contractor in the construction process. 5. Control experiment, load testing and construction inspection during the construction process. 6. Acceptance for the construction stages, work items (if any). 7. Acceptance for the completed works/work items to bring them into use. 8. Inspection of the work acceptance by the regulatory agencies. 9. Establishment of the construction completion dossier, retention of documents about the works and transfer of works. 1. Responsibilities of the contractor in charge of supplying building products, building materials on the market. d) Carrying out repair or replace the products unconformable with the requirements for quality according to the commitment of warranty on the building products and the provisions of the construction contract. dd) Presenting the contract awarder the relevant certificates and documents according to the provisions of the construction contract, legislations on product and goods quality and relevant provisions of laws. c) Carrying out quality control in the manufacture and production according to the procedures agreed with the contractors. 4. The contractors mentioned in Clauses 1 and 2 of this Article shall be responsible for the quality of materials, products, structural components and equipment they have supplied, manufactured and/or produced. The acceptance by the contract awarder does not reduce the responsibilities of the contractors. 1. Receive and manage the construction site, maintain the landmarks and boundaries. 2. Notify the investor and relevant entities about their quality control system, objectives and quality assurance policy for the contruction. The construction work quality control system made by the contractor shall be conformable with the scale of the construction work and shall include the organization chart and responsibilities of specific divisions and individuals for the quality control by the contractor. d) Other necessary matters at the request of the investor and the provisions of the contract. 4. Assign the employees and equipment according to the provisions in the construction contract and relevant law provisions. 5. Take responsibilities for the quality control for the purchase, manufacture and production of materials, products, structural components and equipment used for construction according to the provisions in Article 24 of this Decree and the provisions of the construction contact. 6. Carry out the inspection of building materials, structural components and products, construction equipment and technological equipment before and during the construction process according to the provisions of the construction contract. 7. Carry out the construction according to the construction contract, construction license and construction engineering plan. Promptly notify the investor about the differences between the engineering plan, the documents about the construction contract and the conditions of the site during the construction. Carry self-control of construction quality according to the engineering plan and the provisions of the construction contract. The dossier of quality control for building tasks shall be established according to the regulations and conformable with the actual progress on site. 8. Control the quality of building and equipment installing tasks; supervise the construction of building tasks carried out by the subcontractor, applicable to the construction contractor being the principal contractor or general contractor. 10. Carry out construction surveying and construction monitoring according to the engineering plan. Test run the equipment one by one and all at once according to the plan before applying for acceptance. 11. Set up the construction logbook according to the regulations. 12. Draw up as-built drawing according to the regulations. 13. Request the investor to grant acceptance for the construction transition works, acceptance for the works or work items and/or acceptance for completion of works/work items. 14. Report to the investor the process, quality, workload, labour safety and environmental protection in construction according to the construction contract and/or at the request of the investor. 15. Return the site and move building materials, machinery, equipment and other property out of the construction site when the acceptance for the work is obtained and the work is transferred to the contract awarder or the purchaser unless there is further provision in the contract. q) Perform other activities according to the provisions in the construction contract. 2. The investor may directly supervise the construction process or hire an advisory organization that is proficient according to the regulations to provide supervision to one, some or all of the contents specified in Clause 1 of this Article. b) The investor shall inspect the supervision activities of the general contractor. The investor may appoint a representative to participate in the inspection and acceptance of building tasks and important movement of the construction that is agreed by the general contractor in the plan on inspection and acceptance prescribed in Point a Clause 3 Article 25 of this Decree. 4. 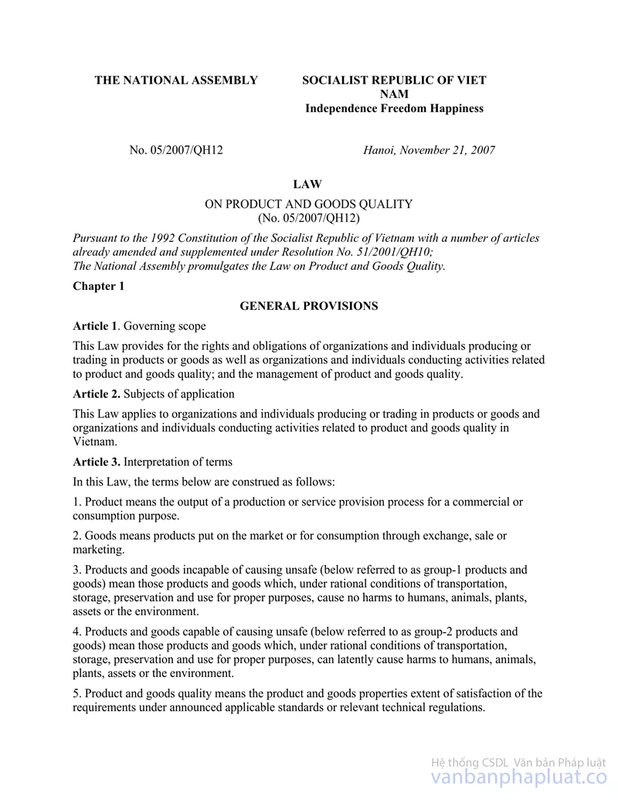 Any entities carrying out the supervision prescribed in Clause 2 and Point a Clause 3 of this Article shall build a quality control system and shall assign staff sufficiently for taking responsibility for supervision at the construction site according to the scale and requirements for supervision activity. On the basis of the scale, characteristic and techniques of the work, the personnel structure of construction supervising organizations shall include a chief supervisor and supervisors. Any people who carrying out such supervision shall have construction supervising practice certificate in accordance with his/her speciality and the construction grades. c) Contractors manufacturing, producing and/or supplying material, products, structural components, equipments used for work construction shall not carry out the quality assessment on products relating to materials or equipment that they have supplied. 6. The Ministry of Construction is in charge of providing instructions on construction supervision activities. 1. Pursuant to the plan on experiment and testing of building tasks and the actual construction progress on construction site, the construction supervisor and the person directly in charge of constructional technique of construction contractor shall carry out an acceptance test on the building tasks to move to the next construction stage. The acceptance result shall be written in the acceptance report and certified for one or multiple building tasks of a work item according to the construction order. 2. When making an acceptance inspection of a building task, the supervisor shall base on the approved construction drawing documents and technical instructions, the technical standards and criteria that are applied, the result of experiments and testing on quality of materials, equipment that are conducted during the construction process relating to the items subject to acceptance. 3. The supervisor shall conduct acceptance inspection of the building task and grant acceptance in writing within 24 hours since the notification of acceptance for building task to take the next stage from the construction contractor is received. If the application for acceptance is rejected, a written notification including explanation shall be sent to the construction contractor. 1. The contractor that is in charge of drawing technical design of three-step design, contractor that is in charge of making construction drawing of one-step or two-step designs shall be responsible for designer's supervision according to the regulations in the construction contract. d) Carry out work acceptance at the request of the investor. If a work item or a work is discovered unsatisfactory for gaining acceptance, such engineering contractor shall promptly send a written notification to the investor. c) There is request from the construction authority. 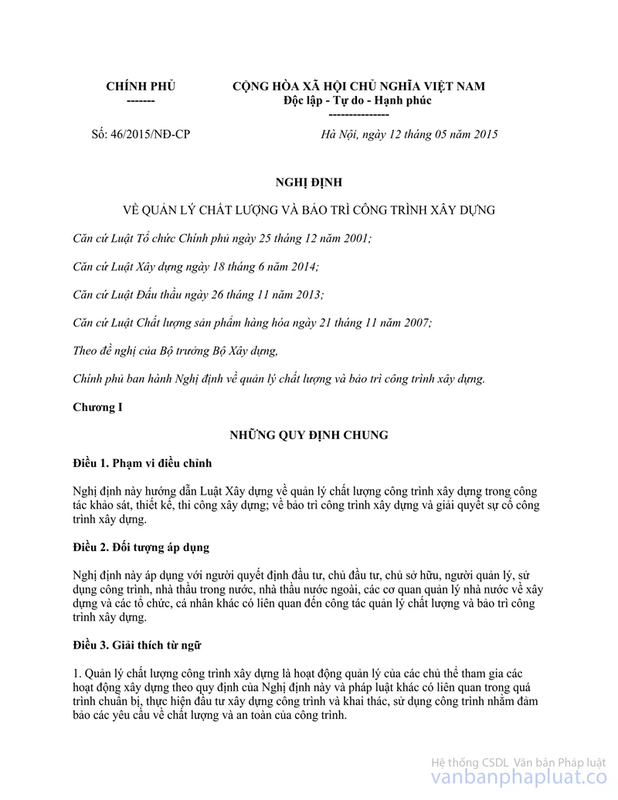 dd) There is request from the State Council for Construction Acceptance or a construction authority. 3. 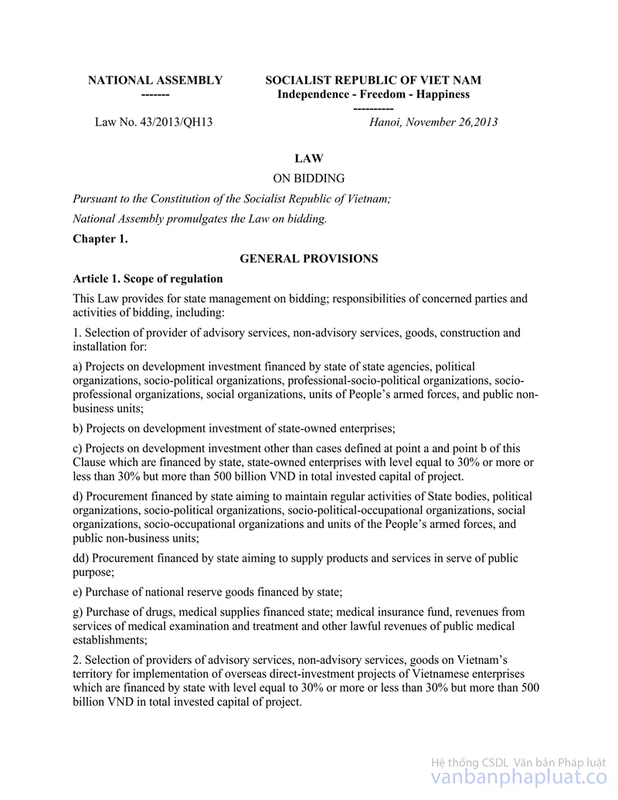 With regard to the cases specified in Point c Clause 1, Points d and dd Clause 2 of this Article, the authority agencies may appoint an advisory organizations according to the shorten procedures for no-bid contract awarding prescribed in Clause 1 Article 56 of the Decree No. 63/2014/NĐ-CP dated June 26, 2014 to carry out the assessment/experiment. 4. The engineering contractor, the construction contractor, the construction products manufacturing and supplying contractor and relevant contractors shall bear the cost for control experiment, quality assessment and experiment on bearing capacity of structural components if the results of such experiment/assessment proves their fault. Otherwise, the costs shall be included in the total investment in the construction. a) A construction stage or a construction part is completed, the inspection and acceptance shall be conducted to assess the quality before taking the next stage. 2. The investor shall negotiate with the relevant construction contractor about the time of acceptance, procedures and contents of acceptance, participant in the acceptance. The acceptance result shall be recorded. 1. The investor shall conduct inspection and acceptance for completion of works/work items. c) The works/work items shall gain the acceptance of fire safety from the Fire department according to the legislation on fire prevention and fighting; gain the certificate for completing the environmental protection work from the EIA (environmental impact assessment) report approving authority according to the legislation on environmental protection and the written approval from another competent agency according to the relevant law provisions, if any. 3. The investor may decide to conduct acceptance for a construction part or conditional acceptance to bring into operation if there are unresolved issues in terms of quality that not threaten the bearing capacity, life cycle and functions of the work and shall ensure that the work conform the requirement for safety. The acceptance report shall specify the shortcomings in terms of quality that need remedial measures or the building tasks that need continuing and time limit for such tasks. The investor shall conduction inspection and acceptance for completion of work when the shortcomings in terms of quality have been remedied or the rest building tasks have been completed. b) Regarding the works specified in Clause 1 Article 32 of this Decree, a competent agency specified in Clause 2 Article 32 of this Decree has conducted an inspection of the acceptance and issued a written approval for the acceptance result of the investor prescribed in Point a of this Clause. Particularly for the construction work using the state budget and the non-budget state funds, the investor shall finalize the construction contract only when the written approval for acceptance result is received. 5. The investor shall negotiate with the relevant construction contractor about the time of acceptance, procedures and contents of acceptance. The acceptance result shall be recorded. dd) Particularly for the construction of electric line, electrical substation with voltage of 35KV and lower, grade IV works using non-budget state funds, the investor shall conduct acceptance test themselves according to the regulations in this Decree. The investor is responsible for reporting the result of such acceptance test to the construction authority according to the competence level specified in Point c Clause 2 of this Article for collection, retention and supervision. 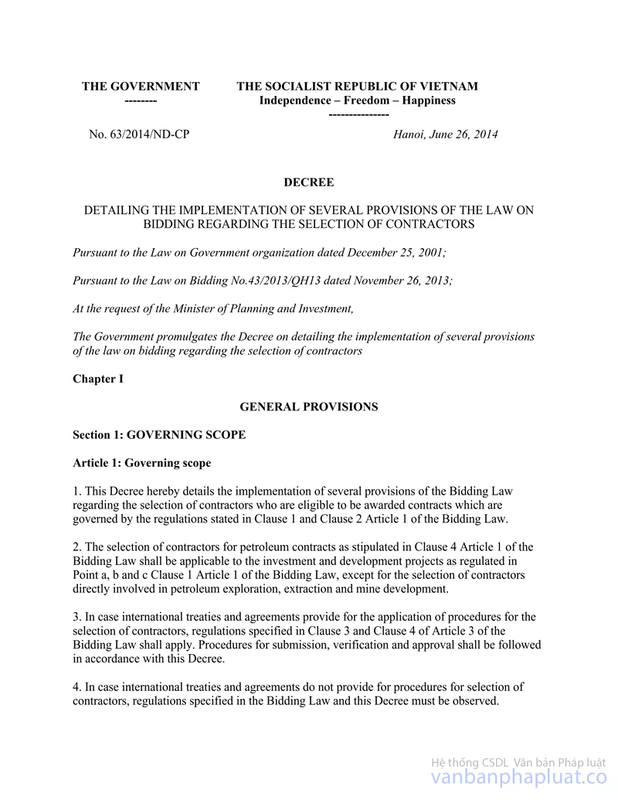 c) The Services of Construction and the Services managing specialized construction works are responsible for the inspection of works located in local are under the management of Services according to the regulations in Clause 4 Article 51 of this Decree, except for the works specified in Points a and b of this Clause. dd) The Ministry of National Defense and the Ministry of Public Security are responsible for deciding the competence in carrying out inspection of National defense and security works. 3. Contents of inspection include the adherence to the regulations on construction work quality control by the investor and the contractors in the survey, engineering planning and construction activities according to the regulations in this Decree and relevant law provisions. e) The competent agency may invite an eligible organization/individual to carrying out the inspection. 5. Cost for the inspection of the acceptance activity during and after the construction process shall be estimated, appraised, approved and included in the total investment in the construction. 6. The Ministry of Construction shall provide guidance on the inspection of acceptance activities during and after the construction. 1. The document on completion of construction work shall be set up sufficiently by the investor before the work/work item is brought into operation. 2. The document on completion of construction work shall be set up for the whole construction investment project if the works (work items) included in the project are brought into operation at the same time. If the works (work items) included in the project are brought into operation at different time, the documents on completion of construction work may be established particularly for such works (work items). 3. The investor shall establish and retain a set of documents on completion of construction work; the entities involving the construction investment shall retain themselves the documents relating to their construction parts. Particularly for the construction of housing and vestige works, the retention of documents shall comply with the legislations on housing and the legislations on historical and cultural works. 4. The Ministry of Construction shall provide guidance on list and retention duration of documents on completion of construction work. 1. The transfer of construction works/work items shall comply with the regulations in Article 124 of the Law on Construction. 2. Depending on the conditions of the work, the work parts/work items that are completed and gain acceptance according to the regulation may be transferred and brought into operation at the request of the investor or the user. 3. In case of investment in the form of public-private partnerships and the competent State management agency sign the project contracts, the investor shall consider satisfying the conditions for transference specified in the project contracts and the provisions of relevant legislative documents. 1. The construction contractor and the equipment supplying contractor shall be responsible to the investor for the warranty for their parts of construction work. c) Particularly for housing, duration of warranty shall be according to the legislations on housing. 3. Duration of warranty for construction equipment and technological equipment is determined according to the construction contract that not shorter than the warranty duration regulated by the manufacturer and is calculated from the day on which the acceptance for completion of equipment installation is issued. 4. Depending on the conditions of the work, the investor may negotiate with the contractors about the warranty duration for specific work item or construction/installation package besides the general warranty duration for the construction as prescribed in Clause 2 of this Article that not shorter than the warranty duration prescribed in Clauses 2 and 3 of this Article. 5. Regarding the work items having shortcomings in terms of quality or problems during the construction process that are resolved by the contractors, the warranty period of such work items may be extended according to the agreement between the investor and the construction contractor before gaining acceptance. 6. The investor shall negotiate in the construction contract with the construction contractors about the rights and responsibilities of the parties in the warranty of construction works; warranty duration of construction works, construction equipment, technological equipment; warranty deposit; the retention, use and refund of warranty deposit and the replacement of warranty money with the warranty guarantee letter from the bank that has equal value. The contractors mentioned above shall have the warranty deposit refunded or have the guarantee letter annulled only when the warranty period expires and the investor confirms the completion of warranty. c) Warranty deposit for construction works using other capital may be determined referring from the minimum rates specified in Points a and b of this Clause. 1. During the warranty duration of construction work, if a construction shortcoming a discovered, the owner, manager or user shall report to the investor to request the construction contractor and the supplying contractor to carry out the warranty. 2. The construction contractor, the supplying contractor shall carried out the warranty for their construction parts, applicable to the breakdowns occurred within the warranty period, when the notification of warranty from the investor, owner, manager or user is received and shall bear all the costs relating to warranty activities. 3. The construction contractor, the supplying contractor may refuse to carry out warranty if the breakdowns are not due to the fault of the contractor or due to force majeure; If the breakdowns are arisen due to the fault of the contractor but the contractor fails to carry out the warranty, the investor is entiled to use the warranty deposit to hire another organization/individual to carry out instead. The work investor, manager or user is responsible for comply with the regulations on operation and maintenance of construction work during the operation of work. 4. The investor shall carry out the inspection and grant acceptance for the warranty of the construction contractor and the equipment supplying contractor. b) The owner, the manager or the user of construction work is also responsible for granting certificate of completion of construction work to the construction contractor and the equipment supplying contractor at the request of the investor. 6. The construction surveying contractor, the engineering contractor, the construction contractor, the equipment supplying contractor and other relevant contractor are responsible for the quality of the construction parts they carry even when the warranty duration expires. 1. Establish and approve of the construction maintenance process. 2. Draw up plan and estimate the expenditure on maintenance of the construction work. 3. Carry out the maintenance and manage the quality of maintenance task. 4. Assess the bearing capacity and the force-bearing safety in operation of the construction work. 5. Establish and manage the documents on the construction maintenance. k) Other instructions relating to the maintenance of the construction work and the stipulation of conditions for ensuring labor safety and environmental protection during the maintenance of the construction work. dd) Regarding the construction works that are operated without maintenance process, the owner, the manager or user of the work shall establish and approve the construction maintenance process. If necessary, a quality assessment of the construction work may be conducted to form the basis for the establishment of construction maintenance process. The remaining useful life of the work shall be defined in the maintenance process. 3. The specific maintenance processes for grade III works or lower, detached housing and temporary works are not required, unless otherwise legislations prescribed by law. The manager of the work still have to carry out the construction maintenance according to the regulations on construction maintenance in this Decree. 4. dd) If there are appropriate technical standards in terms of maintenance or maintenance processes of similar works, the owner or the manager of the work may applied such technical standards or processes without establishment of a new maintenance process. d) Regarding the work applying technical standards for maintenance in the maintenance activity, if such standards are modified or replaced, the maintenance of the work shall comply with the modified ones. 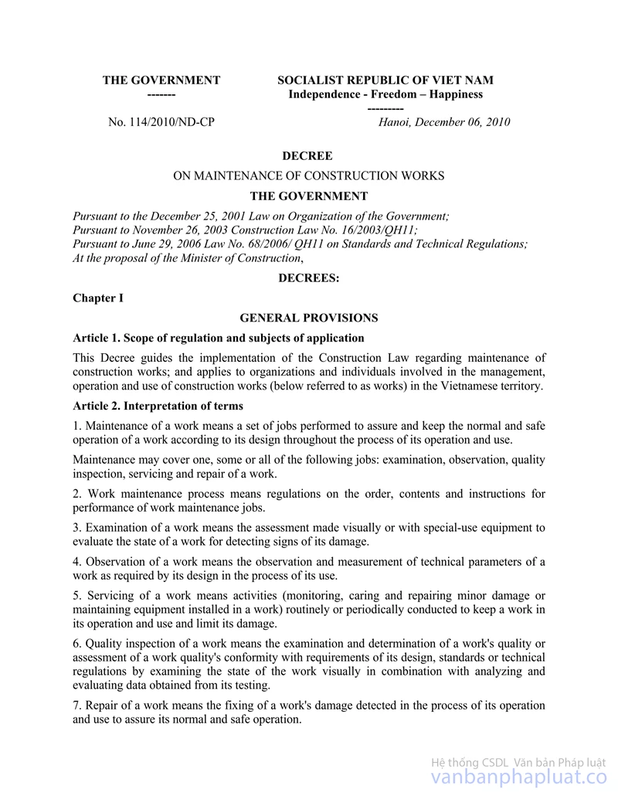 dd) The owner or the manager of the work is responsible for granting approval for the modified contents in the maintenance process, unless otherwise legislations prescribed by law. 1. The owner or the manager of the work shall draw up an annual construction maintenance plan on the basis of the approved maintenance process and the current conditions of the work. d) Expense for task performance. 3. The maintenance plan may be modified during the maintenance process. The owner or the manager of the work is in charge of giving decision on modification of construction maintenance plans. 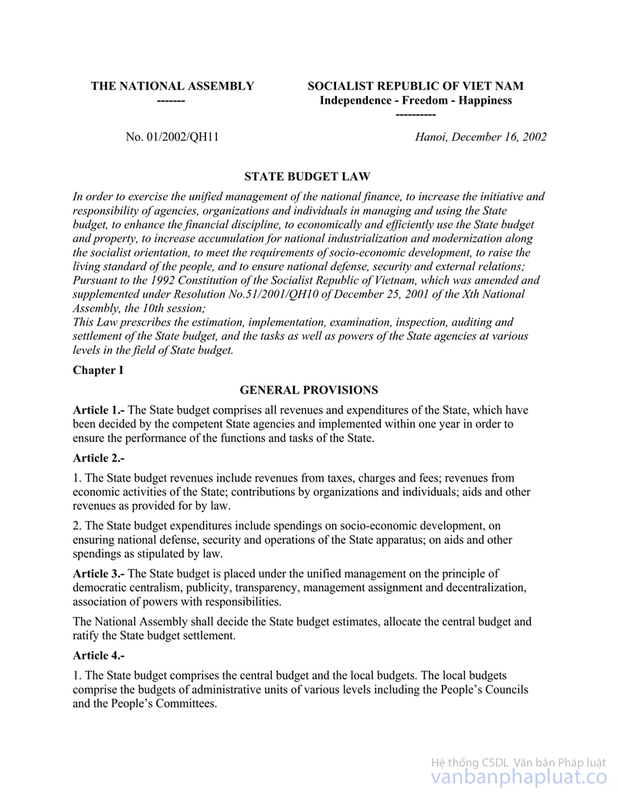 c) Regarding the repair of work without funding from the state budget, the owner or the manager of the work is encouraged to consult and apply the provisions in Points a and b of this Clause. 1. The owner or the manager with satisfactory capacity may conduct the inspection and maintenance of the work themselves according to the approved construction maintenance procedures; otherwise, an eligible organization may be hired to carry out such tasks. 2. The construction work shall be inspected regularly or irregularly to promptly discover the signs of deterioration or breakdowns of the work and equipment installed into the work to form a basis for the construction maintenance. 3. The construction maintenance shall comply with the approved annual maintenance plans and construction maintenance procedures. b) The irregular repair of construction work is conducted when a work/construction part is broken down due to irregular impacts like wind, storm, flood, earthquake, shock, fire and other irregular impact or when a work/construction part has sign of deterioration that affect the safety in operation of the work. dd) There is request from the state agencies in charge of construction. The Ministry of Construction and the Ministries managing the specialized construction works are responsible for promulgating the list of works subject to construction monitoring during the operation. 7. If a work belongs to multiple owners, beside the responsibilities for the maintenance of their own construction part, the owner shall be also responsible for the maintenance of the common construction parts according to the relevant law provisions. 8. Regarding the works that have not been transferred to the owners or the managers/users, the investor shall set up a construction maintenance plan and carry out the construction maintenance according to the regulations in this Article and Article 39 of this Decree. The investor shall transfer the construction maintenance documents to the owner or the manager/user before transferring the work to such entities for operation. 1. The regular and irregular inspection of the work shall be conducted by the owner or the manager/user through observation and the figures from regular monitoring (if any) or using the specialized inspecting equipment if necessary. 2. The maintenance of construction work shall be conducted step by step according to the regulations the construction maintenance procedures. The result of maintenance process shall be recorded and filed; the owner or the manager/user of the work is responsible for certifying the completion of maintenance task and recorded it in the construction maintenance document. 3. The owner or the manager/user of work is responsible for organizing the monitoring and acceptance testing for the repair activities; establishing, managing and retaining the construction repair document according to the legislation on construction management and other relevant provisions of law. 4. The repair of work shall be under warranty for at least 6 months, applicable to grade II or lower work, and at least 12 months, applicable to grade I or higher work. 5. The owner or the manager/user shall negotiate with the repairing contractor about the rights and responsibilities in warranty, duration of warranty, warranty deposit for the repair activity during the maintenance of the construction work. 6. The owner or the manager/user of work is responsible for organizing the monitoring and acceptance testing for the repair activities; establishing, managing and retaining the construction repair document according to the legislation. 7. If the work needs monitoring or is subject to quality assessment, the owner or the manager/user of work shall hire an eligible organization to undertake. If necessary, the owner or the manager/user of work may hire an independent organization to assess the inspection report and the construction monitoring report. b) The investor shall transfer the construction maintenance documents to the owner or the manager/user before transferring the work to such entities for operation. dd) Other legal source of capital. 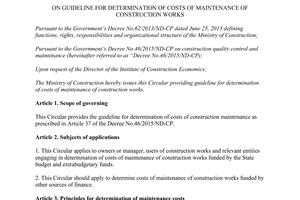 c) Costs for adjustment of construction maintenance process are included in the construction maintenance costs. The contractors in charge of establishing the construction maintenance process shall be responsible for paying the costs for the adjustment of construction maintenance process due to their own fault. c) The owners or the managers/users shall establish and carry out inspection and approval for the maintenance estimate of the construction works using the state budget funds and non-budget state funds to carry out the construction maintenance. d) The agencies specified in Clauses 2, 3 and 4 Article 51 of this Decree shall establish the construction norms for the construction maintenance, depending on the methods for formulating construction norms for the construction maintenance that is guided by the Ministry of Construction, then disclose such construction norms to the contractors of the works appropriate to the peculiarity of the Ministries and local governments then submit them to the Ministry of Construction for management. 4. The owner or the manager/user of the work is in charge of approving the construction maintenance estimate according to the legislation on cost management in construction activities. b) Regarding the construction work not using the state budget funds for maintenance, the owner or the manager/user of the work shall be responsible for the management, payment and settlement of the costs for construction maintenance. 6. 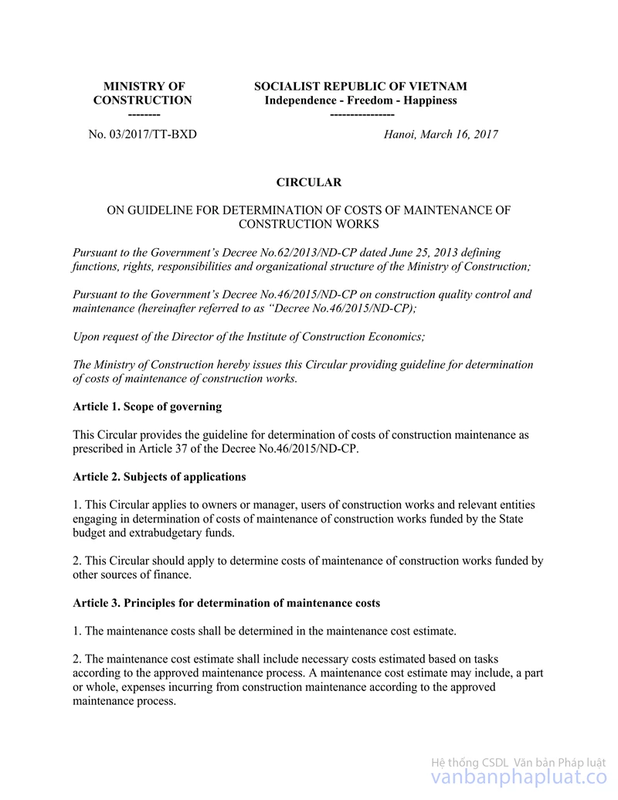 With regard to the cases specified in Clause 8 Article 40 of this Decree, costs for construction maintenance are included in the total investment in the construction of work. 1. Periodic assessments of the safety of the works shall be conducted on important national works, large-sized works with complicated technical requirements, works that exert great impacts on community safety that are in operation. 2. The contents of assessment are force-bearing safety and safety in the operation of works. The assessment of fire safety, nuclear safety and other safety assessment shall comply with the relevant law provisions. 3. The owner or the manager/user of the work shall conduct periodic assessment of force-bearing safety and operation safety then send the result to a competent agency specified in Clause 4 of this Article for supervision and inspection. c) The Ministry of National Defense and the Ministry of Public Security are responsible for the inspection of National defense and security works. 5. Costs for the assessment of safety during the operation of the work include the cost for quality assessment, cost for hiring expert and other necessary expenses paid by the owner or the manager/user of the work and are included in the construction maintenance costs. 6. 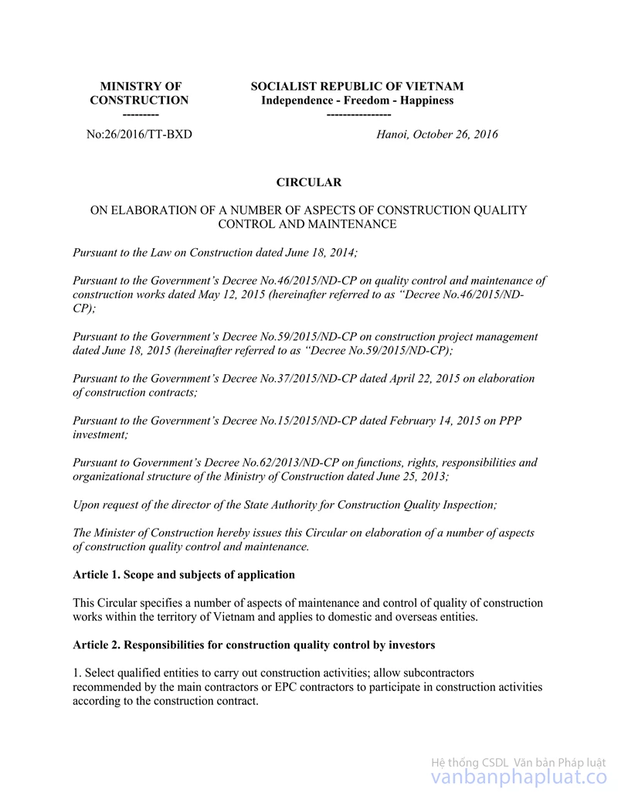 The Ministry of Construction shall preside over and cooperate with the Ministries managing specialized construction works, the Ministry of National Defense and the Ministry of Public Security in defining the construction subjects, assessment frequency, procedures for assessment of force-bearing safety and operation safety of the work during the operation. dd) Repairing any breakdown that potentially affects the operation safety of the work or dismantling the construction works if necessary. 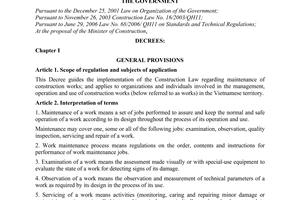 c) In case a construction work/work item is potentially dangerous that may cause collapse, the State management agencies shall preside over and cooperate with the owner or the manager/user to immediately take the safety measures, including the limitation/stop of operation of work and removement of human and properties (if necessary). d) Handling the owner or the manager/user of construction work according to the legislations if such entity does not comply with the requirements of the competent state agencies specified in Clause 2 Article 45 of this Decree. 3. Particularly for old apartment building, apartment building likely dangerous and unsafe to operate, the owner or the manager/user of the work shall comply with the regulation in this Decree and or the provisions of laws on housing. 4. Every citizen is entitled to notify the owner or the manager/user of the work, the authority agencies or the means of mass media about the construction part/construction work that has problems or is potentially dangerous or unsafe to operate for prompt resolution. 5. The owner or manager/user of the work, the authority agency that receives the information about the construction part/construction work that has problem or is dangerous or unsafe to operate shall take the safety measures specified in Point c Clause 1 of this Article. If the problem is not promptly handled and cause damage to human and properties, such entities shall bear legal responsibility. d) Report the results of quality inspection and assessment, result of construction maintenance (if any) to the agencies specified in Clause 2 of this Article for consideration and approval for the extension of useful life of the works specified in Appendix II of this Decree. dd) Particularly for housing, competence in handling shall comply with the legislations on housing. 3. The decision about the duration of the useful life of work after extension shall be based on the specific requirement and technical condition and type and grade of work. b) The owner or the manager/user or work has finished the activities specified in Clause 1 of this Article but the work is still unsafe. 5. The owner or the manager/user of the work is responsible for dismantling the works prescribed in Clause 4 of this Article. b) Collapses of level I or higher works/work items or damage that potentially causes to collapses of level I or higher works/work items. b) Collapses of level II or level III works/work items or damage that potentially causes to collapses of level II or level III works/work items. 3. Level III incidents include the incidents other than those specified in Clauses 1 and 2 of this Article. 1. When the incident occurs, the investor shall immediately report such incident to the local People's committee of commune and the superior agency. When the report on the incident is received the People's committee of commune shall report it to the People’s Committee of district and province. 2. Within 24 hours since the incident occurs, the investor make a written report on the incident and send them to the People’s Committee of district and People's Committee of province of the place where the incident occurs. For any type of incidents, if there is human damage, the investor shall report to the Ministry of Construction and other competent State management agencies as prescribed in relevant law provisions. 3. When the report about the incident is received, the People’s Committee of province shall send a report on such incident to the Ministry of Construction and the Ministries managing specialized construction works, applicable to level I incidents and other incidents that cause human damage. 4. Any competent State management agency is entitled to request the investor and relevant parties to provide information about the incident. 5. If the incident occurs in the operation process, the owner or manager/user shall comply with the regulations in Clauses 1, 2 and 3 of this Article. 1. When an incident occurs, the investor and the construction contractor are responsible for taking promptly the measures for searching and rescuing, ensuring the safety of human and property; limiting and preventing dangers that may continue; protect incident scenes and making reports as stipulated in Article 47 of this Decree. People’s Committees of all levels shall direct and support the relevant parties in organizing search and rescue, protecting incident scenes and carrying out other necessary activities during the process of handling incident. dd) On the basis the actual conditions of local area, the People's Committee of province may authorized the People’s Committee of district to preside over the handling of level III construction work incidents. 3. The investor, the construction contractor or the owner, the manager/user are responsible for taking remedial measures for the incident during the construction/operation process according to the request of the regulatory agency. When the incident is handled, the competent agency specified in Clause 2 of this Article shall decide to continue the construction or bring the work into operation. 4. Organizations and individuals causing incidents shall compensate for damage and pay the expenses for the remedy of incidents according to the nature, level and sphere of incidents. c) The Ministry of National Defense and the Ministry of Public Security are responsible for the inspection of incidents of National defense and security works. 2. The competent agencies specified in Clause 1 of this Article shall establish an incident inspecting team to inspect the incident causes. An incident inspecting team shall include the representatives of the agencies in charge of handling the incident, the relevant agencies and the expert in technical speciality relating to the incident. If necessary, the agency presiding over the inspection of construction work incident causes may appoint an inspection organization to carry out the construction quality assessment serving the inspection of incident causes and find remedial measures. For incidents that lead to serious consequences, the Prime Minister shall decide to establish Incident Investigation Committee under the control of the Ministry of Construction and with the participation of relevant parties to conduct the inspection of incident causes. d) Establish incident cause inspection documents, including the Reports of inspection of incidents causes and relevant documents during the process of the inspection of incident causes. b) If the construction work incident occurred during the work operation process, the owner, manager/user of the work shall pay the cost for inspection of construction work incident causes. When the result of the inspection is received and the responsibilities are defined, the organization/individuals causing the incident shall be responsible for paying such cost. If the construction work incident orcurred due to a force majeure event, the cost for the inspection of construction work incident causes shall be paid by the owner, the manager or user of the work. 1. A report on the inspection of incident scene including: name of the work/work item with the incident; location of construction works and time of the incidents, preliminary description and occurence of the incidents; the status of works when the incident occured; preliminary information on the damage to people and property; preliminary information on incident causes. 2. Documents about the engineering planning and the construction of works which are related to the incident. 3. Document on the inspection of incident causes. 4. Document relating to the handling of incident. 1. Ministry of Construction shall unify the state management on the quality of construction works on a national scale and to manage the quality of specialized construction works, including civil construction works; works for building material industry; works for light industry; technical infrastructure works; urban traffic works excluding railway, river overpassing works and highway. 3. The Ministry of National Defense and the Ministry of Public Security are responsible for the quality of the works for National defense and security. 1. 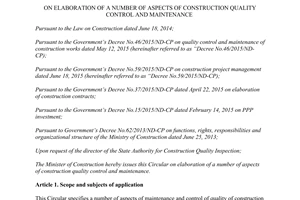 Issue and provide guidance on the implementation of the legislative documents within its competence on the quality control of construction works. 2. Conduct periodic inspections and irregular inspections over the quality control done by Ministries and regulatory bodies and subjects involving the construction and over the quality of construction works when necessary. 3. Request and expedite the ministries managing specialized construction works and People's Committees of provinces to conduct inspections over the quality control and the quality of construction works under their management. 4. Provide guidance on registration of the information of the capacity of construction of organizations and individuals nationwide and post such information on Ministry of Construction’s website according to the regulation. 5. Conduct assessment of construction engineering plan as prescribed in the Decree on construction investment project management. 6. Conduct inspections over the acceptance for specialized construction works under management of Ministry of Construction and cooperate with Ministries managing specialized construction works to conduct inspections over specialized works as prescribed in Article 32 of this Decree. 7. Provide guidance on costs for establishment, inspection and adjustment of maintenance process; determine the organization/individual bearing responsibilities for maintenance of construction works and provide instruction for payment for maintenance cost of the works under the management of the Ministry of Construction; provide guidance on making estimate for the construction maintenance and establish and announce the construction norms serving the construction maintenance. 8. Conduct inspections over the construction maintenance, conduct assessment of force-bearing safety and operation safety of the works. 9. Consider and give decision on continuity to operating the works with expired design life, handle the works having signs of quality deterioration that are unsafe for the operation and provide announcement of information of continuity or suspension of operation of expired works under the management of the Ministry of Construction. 10. Preside over and cooperate with relevant Ministries, ministerial-level agencies and local governments in conducting nationwide inspections of the compliance with the legislation on construction maintenance. 11. Conduct quality assessment on construction works prescribed in Clause 1 Article 51 of this Decree on request or when a work is discover having quality unconformable with the requirement of the engineering plan that potentially unsafe in force-bearing. 12. Conduct inspections of construction work incident causes according to the regulation in Article 49 of this Decree, applicable to the construction works specified in Clause 1 Article 51 of this Decree. 13. Take the prime responsibility for considering presenting awards for the quality of construction works as prescribed in Article 9 of this Decree. 14. Annually and irregularly (at the request) collect and report to the Prime Minister the situation of the quality and the quality control of construction works nationwide. 15. Handle the violations against the regulations on construction work quality control according to the regulation. 16. 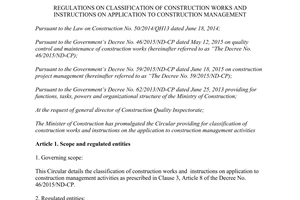 Perform other management contents in accordance with the legislation related to construction work quality control. h) Cooperate with the Ministry of Construction in presenting awards for the quality of construction works as prescribed in Article 9 of this Decree. e) Conduct inspections of construction work incident causes according to the regulation in Article 49 of this Decree, applicable to the construction works specified in Clause 3 Article 51 of this Decree. 3. The Ministries managing specialized construction works and other Ministries and regulatory bodies shall collect and make a report to the Ministry of Construction on the situation of construction quality and construction work quality control activities under their management. The report shall be submitted annually on not later than December 12 of each year or submitted irregularly on request. 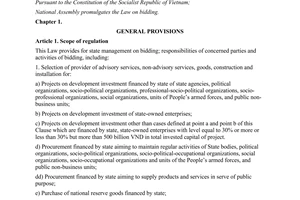 On the basis of the local conditions, People's Committees of provinces may authorize the management board of industrial zones, economic zones and/or hi-tech zones to perform the state management of construction work quality control, applicable to the construction works within the administrative division. 2. Provide guidance on the implementation of the legislative documents on construction work quality control in local area. 3. Conduct inspections over the compliance with this Decree of the organizations/individuals involving the construction in local area. 4. Provide guidance on determining organization/individual responsible for maintaining the construction works according to type of works, capital sources for maintenance and form of ownership. 5. Conduct inspections over the construction maintenance and assessment of the safety of works according to the regulation. 6. Conduct inspections of construction work incident causes according to the regulation in Article 49 of this Decree, applicable to the construction works in local area that are specified in Clause 4 Article 51 of this Decree. 7. Conduct quality assessment on request, applicable to the construction works in local area that is specified in Clause 4 Article 51 of this Decree. 8. Cooperate with the Ministry of Construction in presenting awards for the quality of construction works as prescribed in Article 9 of this Decree. 9. Collect and make a report to the Ministry of Construction on the situation of construction quality and construction work quality control activities in local area. The report shall be submitted annually on not later than December 12 of each year or submitted irregularly on request. 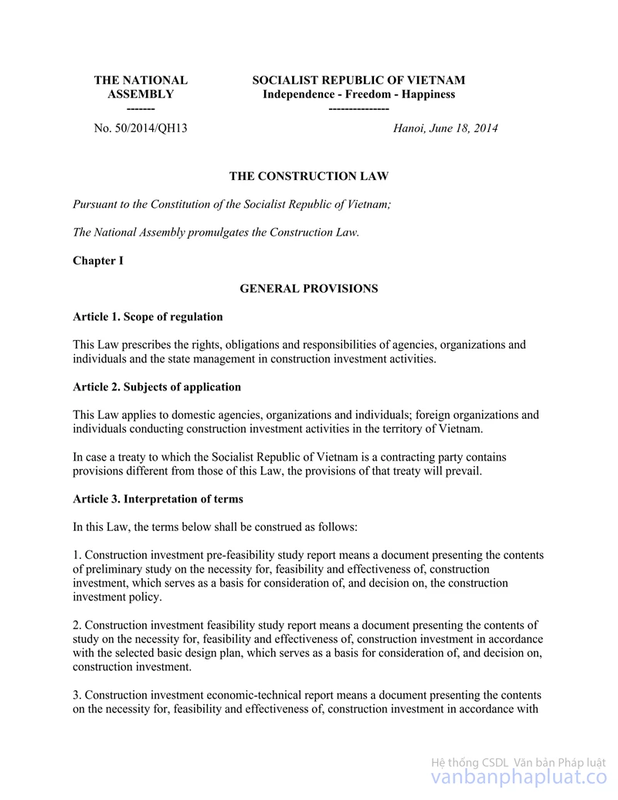 l) Assist the People's Committees of provinces to collect and report regularly or irregularly to the Ministry of Construction the quality condition of construction works in local area; report the list of contractors committing violations against the regulations on construction work quality control when performing construction activities in local area. c) Cooperate with Services of Construction in conducting inspections over specialized construction works on requests and inspections of incident causes to specialized construction works; collect and annually or irregularly report to People's Committees of provinces and Services of Construction the situation of specialized construction control in local area. g) Collect and report regularly or irregularly to the People's Committees of provinces the compliance with the regulations on construction work quality control and the quality conditions of construction works in local area. 4. Within the authority authorized by the People's Committees of provinces, the management board of industrial zones, economic zones and hi-tech zones may perform the state management of construction work quality control, applicable to the construction works within the administrative division. The acceptance for construction works that are started before the effective date of this Decree shall continue complying with the provisions of the Decree No. 15/2013/NĐ-CP dated February 06, 2013 by the Government. The inspection over the acceptance for construction works that are started after the effective date of this Decree shall comply with the provisions of this Decree. 1. This Decree comes into effect from July 01, 2015 and replaces the Decree No. 114/2010/NĐ-CP dated December 06, 2010 by the Government and the Decree No. 15/2013/NĐ-CP dated February 06, 2013 by the Government, except for the provisions relating to the inspection of engineering plan by the regulatory bodies in terms of construction. 2. 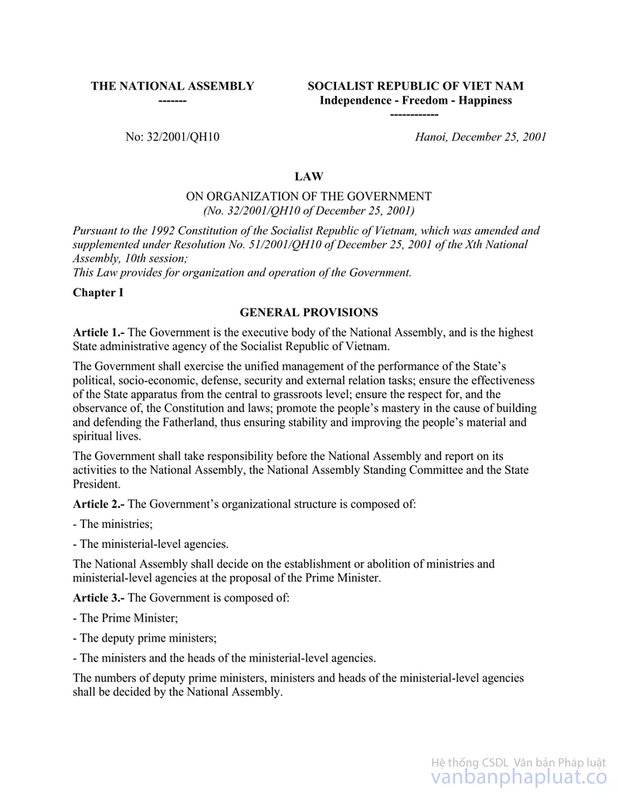 The Minster, Heads of ministerial-level agencies, Heads of Governmental agencies, the Presidents of People’s Committees of central-affiliated cities and provinces, Heads of political organizations, socio-political organizations, socio-professional organizations and relevant organizations/individuals are responsible for implementing this Decree. 3. The Ministry of Construction shall preside over and cooperate with relevant Ministries and regulatory bodies in taking responsibilities for providing guidance and organizing the implementation of this Decree./. 1. Dwelling house: Apartment building and other type of tenements; detached dwelling houses. dd) Religious works and spiritual works. 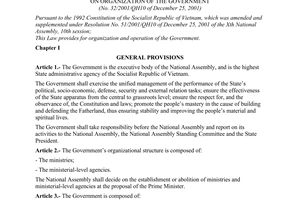 h) State administrative agencies’ office: working houses of National Assembly, The Government, President, Offices of Ministries, Sectors, and People’s Committee of all levels; Offices for political organizations and socio-political organizations. 1. Works for building materials manufacturing: Cement plant; construction material mines and other construction material/product manufacturing works. 2. Metallurgy and mechanical engineering works: Non-ferrous metallurgical plant; ferrous metallurgical plant, steel laminating plant; mechanical plants for dynamic machines, machine tools of all types; Plants for industrial equipment and complete equipment; overhead lifting equipment manufacturing plant; construction equipment plant; plant for industrial equipment and complete equipment; vehicle assembly plants; electric-electronic manufacturing plant; auxiliary industry manufacturing plant. 3. Works for mining and mineral processing: underground coal mines; surface coal mines; construction for coal-sorting, washing and selecting; mineral processing plant; underground ore-mines; surface ore-mines; factory for ore-selecting and ore-enriching; natural bauxite mining; aluminium processing plant. 4. Works for Petroleum industry: marine exploration and exploitation derricks; petrochemical refineries; gas processing plant; bio-fuel processing plant; petrol and kerosene depots; liquefied gas depots; gas and petrol pipelines; liquefied gas extracting plant; lubricant manufacturing plant; waste oil recycling plant. 5. Works for energy industry: thermal power plant; heating plan; steam supplying plant; compressed air supplying plant; hydraulic-electric plant; nuclear power plant; wind power plant; solar power plant; geothermal-heat power plant; tidal power plant; waste-to-energy plant; biomass power plant; biogas power plant; cogeneration power plant; power grids and electrical substation. b) Works for production of industrial explosives; works for production of precursors of explosives. c) Works serving processing of agriculture and aquaculture products: agriculture and aquaculture product processing factory; rice husking factory; factories for processing of other agriculture and aquaculture products. 1. Works serving water supply: waterworks, water treatment works; water pumping station; fresh water tank; water supply system. 2. Drainage works: rain sewer, main sewer; sewage sewer; detention basin; rainwater pumping station; sewage treatment plant; sewage pumping station; works for mud treatment. b) Works for hazardous waste treatment. 4. Public lighting works: lighting system, lamp post. dd) Technical culvert, trench and technical tunnel. 1. Roadworks: highway of all kinds; motorway, road in rural areas; road in urban areas, ferry terminal. 2. Railway: high-speed rail, semi-high-speed rail; urban railway, elevated railway; metro; national railway; specialized railway and local railway. 3. Bridge: road bridge, pedestrian bridge (excluding rope-bridge); railway bridge; floating bridge; rope bridge. 4. Tunnel: Tunnel for cars, railway and pedestrian. 5. Inland waterway works: works serving repair/building of inland waterway vessels (pier, dock, slipway, etc. ); inland wharves; ship lock, ship operating water (on river, lake, gulf and way to isle, canals). 6. Maritime works: seaport; works serving repair/building of inland waterway vessels (pier, dock, slipway, etc.) navigable channels (one-way train); regulating works(dyke for protection from waves/sand, channeling dyke, bank protector). 7. Other marine works: ferries/harbor on island, specialized harbor, floating works; drift signal system on river/sea; lighthouse, beacon. 8. Aeronautical works: airport (including works serving air navigation). 1. Irrigation works: reservoir; dams; spillway flood relief works, sewer to take water, sewer to discharge water, canal, closed pipe for irrigation, hydraulic tunnel, pump station and other irrigation works; hydraulic tunnels; irrigation water pumping station and other irrigation works. 2. Dykes: river dyke, sea dyke; estuary dike and the works on, in and below the dyke. 3. Works serving breeding, cultivation, forestry, salt production, aquaculture and other agriculture and rural development works. Works for National defense and security are the works that are invested from state capital under the management of the Ministry of National Defense and the Ministry of Public Security, serving National defense and security activities. 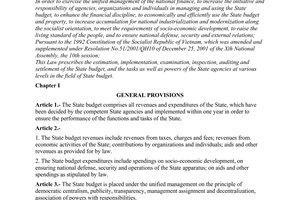 Works for National defense and security that are not included in the works specified in Section I to Section V of this Appendix are treated according to the regulations of the Ministry of National Defense and the Ministry of Public Security. Cable culvert; trench and technical tunnel. Tunnel for cars, railway and pedestrian. Airport (including works serving air navigation).